All-breed show in Dzerzhinsk town. 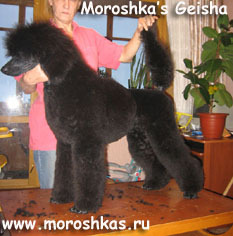 * Moroshka's Geisha (ow.Yu.Yablonskaya/S.Dmitrova) became BOB Baby! * Creative Power (ow. O.Urlina) - got het last CAC for Russian Championship (she also will be connected to our kennel). * Shens-Bizhu Janeira Danielly - Ray's wife and Nika's mother- became BOB! We congratulate the girls with wins! * Moroshka's All That Jazz (ow. S.Zhukova) - CAC, BOB, BIG-2! * Moroshka's Boogiw Woogie Man (ow.N.S.Slivova) - JunCAC, BOB Junior! Aтв he got all the needed certificates for the Junior Russian Champion title! CONGRATULATIONS! 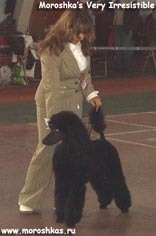 Anuual autumn Poodle Club Show. Moroshka's Busy Bee - CW, BOS. On an All-breed Show she won CAC and BOS and Moroshka's All That Jazz (ow.S.Zhukova) also got CAC. 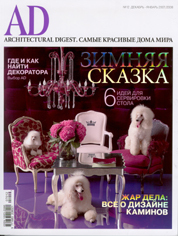 An issue of magazine AD appeared and on the cover we see our Nika - Pina Colada for Moroshka! She took part in shootings for that magazine. 18 nov. 2007- In Nizhny Novgorod city our girl Gelia (Moroshka's Geisha, ow. Yu.Yablonskaya/ S.Dmitrova) has her debut on a show. Gelia received excellent description and became BOB Baby! Also went excellent daughter of our Ray - Palmira De Life. She became Best Junior and 2nd best Standard Poodle. BOB was wife of Ray and mother of Nika - Shans-Bizhu Janeira Danielli (ow. Ju. Yablonskaya)! 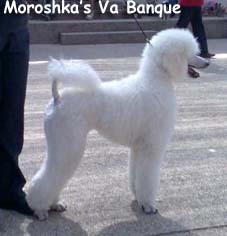 Congratulation to Julia Yablonskaya who prepared and showed 3 standard poodles at one show and went for participation to BIS finals!!! * Moroshka's Get Smart (ow. D. Goriachkina) - BOB Baby abd BIS Baby Specialty!!! Congratulations with excellent debut, Rick!!! *Moroshka's All That Jazz (ow. 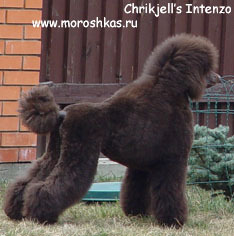 S. Zhukova) - C.Ch.C., Best Male and BOB. Also 2nd Standards Poodle of the Show! Well done, Jazz and Sonia!!! * Pina Colada for Moroshka (ow. S.Dmitrova) - exc, 2nd Junior! * Chrikjell's Intenzo (ow. M.Maslova/S.Dmitrova) - JunCAC on the all-breed and Jun C.Ch.C. on the Specialty. 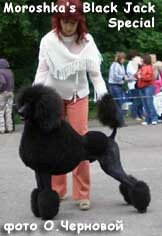 Also on the Specialty Juhan was 3rd best Standard Poodle. Moroshka's Very Irresistible (ow. 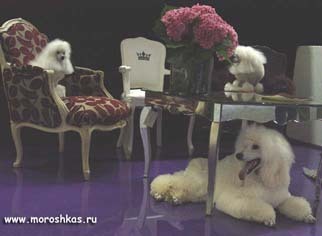 M.Siatisheva/S.Dmitrova) was shown in her city of Samara and went BOB Puppy and BIS-3 Puppy!!! We congratulate the girls and we are proud of them! We got some excellent news from far Izrael. Our snow-white Booch (Moroshka's Va Banque, ow. M.Krush-Bram) did well on the show on the 13th of October (expert Avi Marshak). He got the mark "very perspective" and won BOB Puppy!!! Ecxellent debut!!! We congratulate our boy and all the Krush-Bram family!!! 13 october 2007- On the show of Club "Nord" our Kapa (Moroshka's A Capella, ow. S.Dmitrova/E.Massalskaya) did well, she won CAC and Best of Breed! Congratulations! Our Nika (Pina Colada for Moroshka, ow.S.Dmitrova) took part in the shootings for the glamourous "Interrier & Design" magazine. Please find our star in the December issue! * Dandy-Lion's Boy On The Rocks - CAC, CACIB, Best of Breed!! We thank all our competitors, it was very hounourable to win this competition!!! * Dandy-Lion's Boy On The Rocks - CAC and fullfilling the "dad's" words: "No bests, quickly go home", he jumped all the way during comparison and became 3rd best male. * Dandy-Lion's Boy On The Rocks - ecx, 3rd in the Champion's class. * Moroshka's All That Jazz - exc 2 in the Intermediate class. That was his first show in the grown-up class. Congratulations! * Moroshka's Busy Bee - exc1, CW, JunCAC, Junior BOB! CONGRATULATIONS!!! Our Lialia (Moroshka's Very Irresistible, ow. M.Siatisheva/S.Dmitrova) in her Samara city took part in two shows - All-Russian and Specialty. On the Specialty Show she became BOB Puppy and won Best-In-Show Puppy! Congratulations! And thank you Galina Savina for such an appreciation of our baby girl!!! 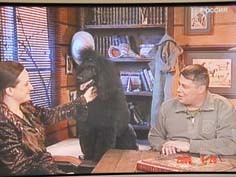 On an All-Russia All-Breed show Lialia again became BOB Puppy and also Res. Best-In Show Puppy! 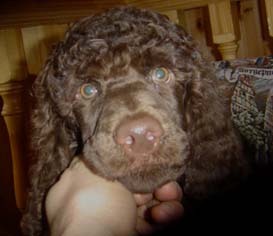 Not bad for a standard poodle puppy! Congratulations, Marina and Lialia! Way to go! 17 sept. 2007- Yesterday, September 16th was the "First Ball" of our baby girl Lialia (Moroshka's Very Irresistible, ow. M.Siatisheva/S.Dmitrova). 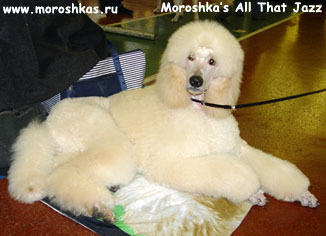 She became BOB Baby and made an excellent impression to all the poodlefans in Samara! Good start, Marina & Lialia! 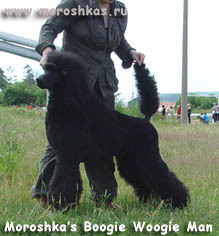 In Kaluga town our black boy Moroshka's Boogie Woogie Man (ow. N.S. Slivova), made his debut in Juniors class. His trophees are: JunCAC, BOB Junior, BOB and finally Best-in-Group!!! Bucho becomes Group Winner from the very start! CONGRATULATIONS to his owners and groomer Galina! * Regional All-breed Show (judge - I.Begma) - JunCAC, BOB Junior! 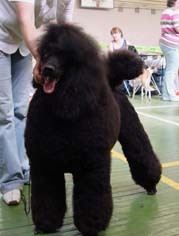 * Speciality Show (judge B.Petersburs) - JunC.Ch.C., BOB Junior! We are proud to announce that we have newborn puppies in our kennel (litter G)! Proud parents are: Fenia (Finnesse Queen of Olympus) and Kompis (Dandy-Lion's Boy On The Rocks). We have 10 kids: 2 brown males, 4 black males, 4 black females. All black puppies carry brown gene. Seroius inquiries are welcome! And again we have nice news! * Today at All-Russia Dog Show in Obninsk town Jazz (Moroshka's All That Jazz, ow. S.Zhukova) gained his first JunCAC, bacame BOB and was BIG! * Also from the Kaliningrad city - Moroshka's Black Jack Special gained JunCAC, became BOB and was Junior Res.BIS!!! Thanks to his owner and Olga Chernova for support! CONGRATULATIONS! * Chrikjell's Intenzo (ow. М. Маslova/S.Dmitrova) - BOB Puppy!! * Pina Colada for Moroshka (ow. S.Dmitrova) - BOB Puppy and BIS-3 Puppy! 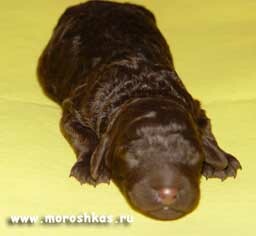 Congratulations to Nika, also to her daddy - Pups and mom - Niura and breeder J. Yablonskaya from the Nizhny Novgogorod! * Dandy-Lion's Boy On The Rocks (ow. S.Dmitrova) - C.Ch.C., and in the strongest competition becomes NATIONAL CLUB CHAMPION!!! HURRA!!! * And our biggest success - Moroshka's Busy Bee (ow. S.Dmitrova /Ch.Weihua) - BOB Junior, Young National Club Champion and wins JUNIOR BEST IN SHOW!!!! Congratulations to all the participants, you are all the BEST!!!!! New pictures of our chocolate boy Juhan (Chrikjell's Intenzo). He turned 7 months old. Here are the first photos of out newborn puppies - see the Puppies section. Pleasant news from Kaliningrad city! 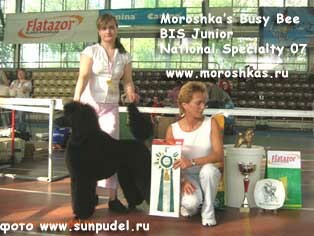 Our black boy Moroshka's Black Jack Special attended all-Russia show in his city. He gained the title of BOB Puppy and went to the Best in Show. There inspite his being not experienced in show, he became ResBIS Puppy among more than 20 puppies of all breeds!!! Hurra!!!! We are very proud of our son and want to thank Marik's owner and Olga Chernova (kennel "iz Yantarnoy Strany") for the efforts and this nice win!!!!! Our wonderful Tsutsa gave birth to 4 nice babies - 2 boys - black and white and 2 girls - black and white. Details see in the "Puppies" section. * Moroshka's Busy Bee (ow. S. Dmitrova & Ch. Weihua) - Very Promising, BOB Puppy both days, Niusha showed herself very good and even with the loudest musing at the Best in Show she was excellently showing herself and representing our breed. * Dandy-Lion's Boy On The Rocks (ow. S. Dmitrova) - exc4, Kompis showed only at first day. * Revolutsyja iz Volzhskoy Serenady (ow. S. Dmitrova & М. Rybina) - was showing only at first day and was ex1, JunCAC & BOS! Update (new pics) on the page of our brown boy Juhan (Chrikjell's Intenzo). * Moroshka's Busy Bee, ow. S.Dmitrova and Ch. Weihua, became BOB Baby and won Best-in-Show Baby again! * Moroshka's All That Jazz, ow. 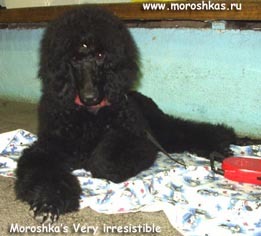 S. Zhukova became BOB Puppy and was Res.BIS Puppy! Good for a debut! * Revolutsyja iz Volzhskoy Serenady, ow. S. Dmitrova and M. Rybina won C. Ch. 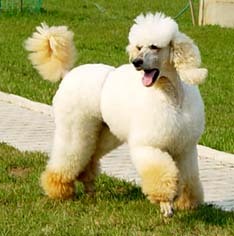 C. certificate and became BOB also 3rd Standard poodle on the show. * Dandy-Lion's Boy On The Rocks, ow. S. Dmitrova, was CW, got C. Ch. C. certificate. Only 1 left to become a National Club Champion! Annual Speciality show of National Poodle Club. We participated with the same team. * Moroshka's Busy Bee, ow. S.Dmitrova and Ch. Weihua, became BOB Baby and won Best-in-Show Baby! Good girl Niusha, after week of intensive training showed herself in such a way that gained the following description:" Very perspective, high quality, very good angulation in front and rear, taiset, neck, very beautiful headpiece, years reach P1, beautiful small dark eye, moves beautifully, VERY GOOD IN SHOWING HERSELF. Mark - very perspective, best baby." Remarkable progress! * Dandy-Lion's Boy On The Rocks, ow. S. Dmitrova, ex, CW, C. Ch. C. Kompis also has a progress in showing and growing his hair. * Revolutsyja iz Volzhskoy Serenady, ow. S. Dmitrova and M. Rybina, our "fire-dog", got her second Jun C. Ch. C. (by this gained all the certificates for the title of Junior Champion of Russia), became Best Junior and BOB! 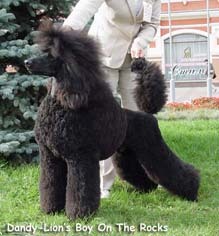 * Dandy-Lion's Boy On The Rocks, ow.S.Dmitrova - ex, CW, C.Ch.C., by this have closed the title of Russian Champion! Congratulations to Kompis! * Revolutsyja iz Volzhskoy Serenady, ow. M.Rybina and S. Dmitrova - Ex, CW, BJ, JunC.Ch.C., BOB. She did not stay for finals. *And our young "crazy frog" Niusha - Moroshka's Busy Bee, ow. Ch. Weihua and S. Dmitrova, was Very Perspective Baby 2 as she did not want to show, but only to play! We have a new member in our kennel. Our new boy is of a brown colour. He was born in kennel Chrikjell's of Sweden. We congratulate his new family with the new chocolate family member. And thans to Christina and Kjell Sohlmann for our nice boy. Kompis got his 5th CAC on an All-Russia Show "Derzhava"
On the "Puppies" page there are pics of newborn puppies sired by our Poops-Ray (Emerei In The Ray Of Light). Proud mother - Shans Bizhu Janeira Danielli (ow.Ju. Yablonskaya, Nizhny Novgorod). If you want to become an owner of white miracle, you are mostly welcome! Call us! Show of KSS "Odintsovo". Our baby Moroshka's A Capella had her debut. 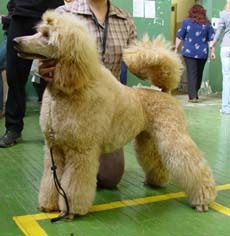 Our girl showed very good, as an experienced show-poodle under precise handling of Irina Riazanova. The result is BOB Baby. And Кompis won his 4th CAC and became BOB, he passed more than half way to the Russian Ch title.. Also mommy of our "B" litter Fenia went out for a show and inspite of her "Modern" cut got her first CAC, and at the same time made good friends with the young handler Dasha. And again we were on the show. This time "Fauna" club. Karina continues to study how to behave in the ring and by the way becomes the Best Puppy of Breed. Nice win! And Kompis gets his third CAC, becomes RKF Champion and BOS! Congratulations! Beautiful lady Karina - now almost a grown-up! Now you can have a look at the litter "B" pedigree at the Puppies page. Our Tsutsa (Emerei Isn't She Lovely) continues her show marathon. Her pups are only 3 months old, and she gets CACIB and BOB at the International Show in Kursk city! And that is in her brand new Continental clip! Congratulations! On a show of club MGS ROSTO in Moscow we entered with Karina (Revolutsiya iz Volzhskoy Serenady, ow M.Rybina and S. Dmitrova), who finally understood why she is on the rings with handler and Kompis (Dandy-Lion's Boy On The Rocks, ow. S. Dmitrova), who gained his second CAC and became BOB. All our "A.." puppies have found their new owners. 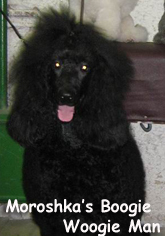 We wish to our kiddies long, interesting life, full of love and we are ready to help their moms and dads in anything we can, be they experienced poodle-owners or just new in our BEST breed in the world - Standard Poodle! And our babies from litter "B.." are still looking for their solely moms and dads! We have newborn again! Our Fenia produced 7 charming black babies. 4 girls and 3 boys. In this litter we implemented our idea to accumulate the bloodlines of Torpaz kennel, descendants of which are very stylish and win prestigeous shows around the Europe. This combination is quite unique as Fenia came to us from Canada. 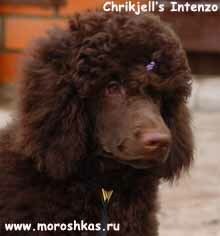 Also it is a big hope that these pups will help to establish the line of brown standard poodles in Russia. Glamorous! Our Woodoo continues to spend his free time with pleasure! He enjoyed the shooting for the Russian radio calendar with beautiful ladies. The photographer kindly passed these pictures to us. So, you can see how glamorous dogs spend their summer time on the yahts of Moscow-river! Our reddy girl - Karina - decided to try herself and her owner (Marina Rybina) in the show ring of her first show in life. She became best baby of the breed and even in the Baby Best in Show for about 2 minutes seemed to be an experience show girl, but then decided that it is enough for a small girl and hanged on her owner. Anyway, that was a really good debut and we congratulate Karina and Marina! Good job, girls! Kompis visited regional show of the kennel club "Antey", where he managed to get hid first CAC and BOB inspite the fact that his cut was made by the owner for the first time! Congratulations to all of us with this double debut! Pedigree of litter Moroshka's A... appeared. Some of our pups are still looking for new owners. 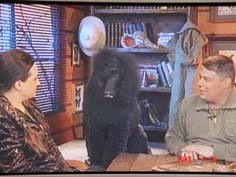 We participated in the TV show "Dialogs about Animals". Together with Kompis we gave an interview to Ivan Zatevakhin, the well known reporter of the show. We have updated our Plans! First puppies under our kennel prefix are born! 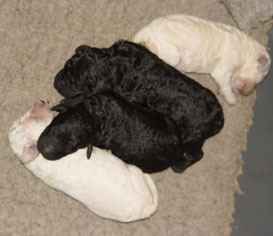 We proudly present the litter Moroshka's "A": girls - 1 white (reserved) and 2 black; boys: 1 black and 1 white! On an International Show in Estonia our Tsutsa won the champions class and became BOS, taking Estonian CAC and becoming Champion of Estonia and also taking CACIB. Good job, Tsutsa and Irina! The win with such a competition is a prize! All-Russian show of ROSTO. Emerei Isn't She Lovely (ow. I. Riazanova and S. Dmitrova) became Best of Breed. Date of this site birthday (Russian part at least). And on 28th of october my kennel prefix "MOROSHKA'S" was confirmed by FCI-RKF.